With the way their single “Safe and Sound” suddenly seems to be all over the airwaves, it’d be easy to believe that the band Capital Cities have suddenly appeared out of thin air and achieved success, but the reality of the situation is a bit different. Popdose had an opportunity to chat with Sebu Simonion, who – along with Ryan Merchant – makes up the core of Capital Cities, and he gave us the back story on the band and how long it’s taken them to find their way into the upper reaches of the charts. Popdose: Not to start off by dismissing your original material, because that’s not my intent with this compliment, but…Capital Cities really do deserve acclaim for managing to take the Bee Gees’ “Stayin’ Alive” and actually make it their own. That’s not easy. Sebu Simonian: [Laughs.] Thanks! Yeah, we like to take on the challenge of doing covers. We’ve done a bunch, and that’s one of the ones that we did where…we take an old song and totally spin it in a new light. So how did you and Ryan come together as collaborators? We met on Craigslist! He was looking for a producer, I had put out an ad, and he gave me a call. After that, we hooked up and just started working on music. We did music for commercials for awhile, and then eventually decided to start a band in 2010. What was your musical background? Did you grow up in a musical household, or did you just find music on your own and fall in love with it? Both. [Laughs.] I definitely fell in love with music. I’ve been in choirs all my life, and I’ve played a little bit of piano and guitar and drums since I was a kid. I started my first band when I was 16, I opened up a recording studio when I was 23, and I produced and played in bands for several years. Yeah, I’ve been immersed in music all my life. How was the process of collaborating with Ryan the first time? Was it just a case where you decided you wanted to work together and sat down and gave it a shot? Well, he was looking for a producer for his solo project, so when we worked on a couple of songs for him, he hired me as a producer. And then he started getting jobs to write music for commercials, and he asked me to help him write for that, so we partnered up for that, and we did that for a couple of years. And then we decided to start a band. So we worked together creatively for about three years before we ever decided to start a band as an artistic project. When you finally did decide to start the band, did you go in with a specific vision of what you wanted the sound to be, or did you just put your heads together and see what might come out? I think we just put our heads together. And this is what came out. [Laughs.] I think there’s definitely a lean towards alternative electro dance pop, I guess, if you will. Most of our songs have dance beats to them and a lot of electronic elements, but, y’know, we just kind of throw things at the table and see what sticks. Starting your career by releasing a single called “Beginnings” is very much an on-the-nose maneuver. [Laughs.] Yeah. “Beginnings” is probably our most non-dance track that we ever put out. 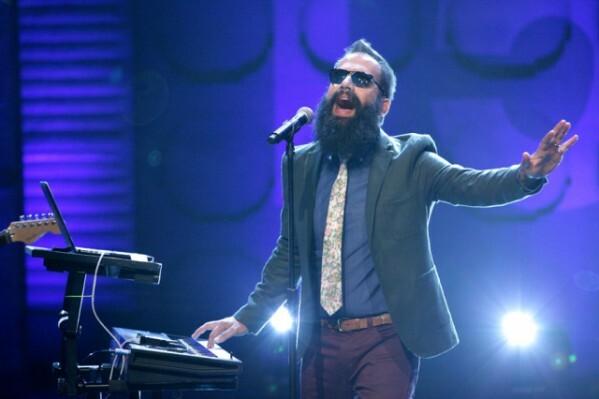 It was the first song that we ever put out as Capital Cities. But we quickly transformed into more of a poppier, dancier outfit after that. “Safe and Sound” has definitely gotten not only a lot of acclaim but also a lot of exposure. No doubt you were ecstatic about it, but were you surprised that people picked up on it as suddenly as they did? Actually, “Safe and Sound” took quite awhile to reach where it is right now. We released it for the first time in the early part of 2011. [Laughs.] That was as a single, and then it was part of the EP we released that summer (Capital Cities), in June of 2011. So it’s been out for more than two years! But, y’know, from the get-go, the blogosphere was very positive about it, and the acclaim, I think, is what helped us build a loyal grass-roots fanbase globally. Because it was all online, and it was all D.I.Y. So for about a year and a half, we saw the song just gradually climb amongst the internet charts. Then it started getting played on the radio internationally in random places like Peru and Germany and Indonesia before it got any traction in the States. But then the radio stations here eventually followed suit. How did you manage to get Andre 3000 to guest on In a Tidal Wave of Mystery? Andre 3000 is one of our favorite hip-hop artists, and we have a song called “Farrah Fawcett Hair” in which we kind of list off undeniably good things in life, so one of the things we thought about was Andre 3000. So we just kind of had this spontaneous idea of asking him to do a verse on it, and our manager was able to connect with his manager and sent him the track. And he liked it…and he is now on it. [Laughs.] And we are ecstatic about that! And within the same song, you’re catering to a different demographic by having NPR’s Frank Tavares make a guest spot. [Laughs.] Yeah, and he was part of the plan as soon as we decided to experiment with that song. We reached out to him over a year before we actually got him to record those parts, but he was thrilled to be a part of it, because he thought it was a clever idea. Are you guys devoted NPR listeners? When you take a look at In a Tidal Wave of Mystery…well, as you said, “Safe and Sound” came out well before the album. What was the process of putting it together? Did you do it on a song-by-song basis, or did you actually go in with the intent of making an album? Yeah, I think it was a song-by-song situation. The 12 songs that are on it are essentially 12 songs that we’d written over the course of the past three years, “Safe and Sound” being one of the first songs that was written. And then as we kept going and developed the project and played shows, we just kept writing and recording songs right up until the time when we actually signed with Capitol Records, which was just in November of this past year. That’s when our 12th and final song was pretty much written and completed. We obviously had to do some touchups and some remixes after we got signed, just to tweak the album and make sure it was sounding just right, but the songs were pretty much complete when they signed us. So the process was very smooth, in that the album was complete, and they picked it up as soon as we signed with them and began our promotional campaign, with plans to release it in June. So it’s out now, and we’re touring it. Given the fashion in which it came together, do you think it still holds together well as an album? Yeah, I do. I think it’s a cohesive album. But each song kind of has its own world, if you will. Each song has its own personality. So, y’know, it’s a combination of being a cohesive record and also just being a compilation of interesting songs. How did you guys hook up with Grady Hall to do the “Safe and Sound” video? Did you reach out to him? Yeah. When we were brainstorming on the ideas for doing the music video with the Capitol Records people, they said that it would be great to reach out to Motion Theory and Grady Hall. And they did, and we worked on the “Safe and Sound” video together, and…it’s really amazing. How was the experience of doing Conan? How are the live performances going? Based on the music, people might not necessarily think that you’d be able to translate it to a live setting, but the clips on YouTube certainly make it seem like you’re doing it pretty effectively. Yeah, so far, so good. [Laughs.] This is our first tour, and every show has gone over well. The crowds have been really receptive and fun. Do you regularly incorporate your covers into your live performances? Definitely. That always goes over well. Are there any covers in the set that you haven’t recorded yet? Actually, there aren’t! So far, everything that we’re playing at our live show has been released. So are “Nothing Compares 2 U” and “Breathe” part of the set, then? Yeah. And then “Stayin’ Alive,” and we’ve also got a cover of Madonna’s “Holiday.” [Laughs.] We might be running the risk of being considered a cover band. As far as your originals, do you guys have an actual regiment when it comes to writing new material, or do you just do it when the inspiration’s there and the time feels right? Yeah, it’s pretty much the latter. [Laughs.] Whenever inspiration strikes and whenever we have time. Right now, we’re so busy with the tour, and whatever free time we have at home, we’re preparing for future tours or working on a music video. So there isn’t going to be much writing, at least actively, right now. We try to find some time on the tour bus to do little demos and record ideas on our little iPads or laptops, but nothing significant at the moment. Yeah. And Japan, Korea… It’s pretty exciting. Makes sense, though, given that, as you mentioned, your music first started to see traction outside of the States. Lastly, the “who are your influences” question is awful, I know, but I’m curious if there’s any influence in the music of Capital Cities that we don’t necessarily hear? Possibly. Personally, I’m a pianist, I took private lessons as a kid, so I love Chopin and Beethoven and Mozart and Bach…all the classics. And I think some of the harmonic textures and melodies and counter-melodies that are in our music might’ve been influenced by that classical music. Do you think you’ve got a symphony lurking somewhere inside you?